HOW TO ORDER LTT STANDARD BASES? Select the nearest size (Wxl) of a LTT Std Mould Base (for plastic moulds LTT-P-Series for Die casting LTT-D-Series) also select the Cavity & Core plates ( KO 2 & KO 3 ) and spacers (KO5) according to your ejection strock. 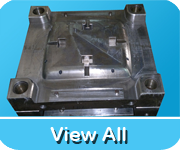 Standard mould base material will be of mild steel guide piller, guide bushes, Sleeves & Push back Pins will be EN 36, Hardened to 55-58 RC.